Azerbaijan has announced a "unilateral ceasefire" in fighting with Armenian forces over the disputed Nagorno-Karabakh region. A defence ministry spokesman said the Azeris were acting in response to international calls to halt violence. But the Armenia-backed Karabakh forces said this was false and Azerbaijan was continuing to fire shells. Nagorno-Karabakh has been in the hands of ethnic Armenian separatists since a war that ended in 1994. Fighting had continued into Sunday, after clashes left 30 soldiers dead and caused civilian casualties. "Azerbaijan, showing goodwill, has decided to unilaterally cease hostilities," the Azeri defence ministry said in a statement. It warned it would strike back if its forces came under attack. But David Babayan, a Karabakh military spokesman, told AFP news agency that fighting had not stopped. "Fierce fighting is under way on south-eastern and north-eastern sectors of the Karabakh frontline," he said. Another spokesman, Senor Hasratyan, was quoted by Armenian media as saying Azeri forces were using Grad missiles and heavy artillery to shell the northern Karabakh area of Martakert. Other reports from Armenia said two Karabakh soldiers had been injured in the fighting. Earlier, Turkish President Recep Tayyip Erdogan had said he backed Azerbaijan "to the end" in the clashes. Turkey has close ties to Baku but does not have relations with Armenia because of the dispute over mass killings of Armenians during the Ottoman era, which Armenia says was a genocide. Turkey staunchly denies this. On Saturday Armenia said 18 ethnic Armenian troops had died, while Azerbaijan said it had lost 12 troops. There were also civilian casualties. The Karabakh defence ministry said a 12-year-old boy had been killed and two other children injured. The Azeri authorities said two men had died, both passengers in separate vehicles which were struck by artillery fire. A further 10 people were injured, they added. Azerbaijan accused the Armenians of firing on areas away from the front line, striking a primary school, houses and factories. Each side blamed the other for starting the violence. 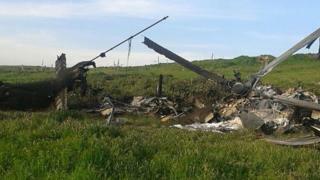 Azerbaijan said its forces had taken over two strategic hills and a village but lost a helicopter. Armenia's government said Azerbaijan had launched a "massive attack" with tanks, artillery and helicopters. The BBC's Reyhan Demytrie in Tbilisi says there have long been fears that hostilities between the two nations, which are highly militarised and possess sophisticated weaponry, could spiral out of control. Mr Erdogan also criticised the Minsk Group - a body under the Organization for Security and Co-operation in Europe (OSCE), chaired by the US, Russia and France and tasked with resolving the conflict. He said it had "underestimated" the situation. "If the Minsk Group had taken fair and decisive steps over this, such incidents would not have happened. However, the weaknesses of the Minsk Group unfortunately led the situation to this point," he told an Azeri reporter during his trip to the US, the presidency said. Fighting between the two sides began in the late 1980s and escalated into full-scale war in 1991 as the Soviet Union collapsed, killing about 30,000 people before a ceasefire in 1994. The region, which lies inside Azerbaijan but is controlled by ethnic Armenians, has since run its own affairs with Armenian military and financial backing, but clashes break out on a regular basis. BBC Azeri's Konul Khalilova says leaders on both sides have been blamed for stoking the conflict to stay in power rather than seeking peace. Karabakh is the Russian rendering of an Azeri word meaning 'black garden', while Nagorno is a Russian word meaning "mountainous".